OLA “Cocina del Mar” is a contemporary Spanish restaurant and bar. Located in Tower 3 of Marina Bay Financial Centre, OLA is an open kitchen concept, serving only the freshest and most seasonal produce. Having as a main focus seafood from around the world. The kitchen is the soul of the restaurant. It’s a live showcase in front of the customers, who are welcomed to interact freely with the chefs. 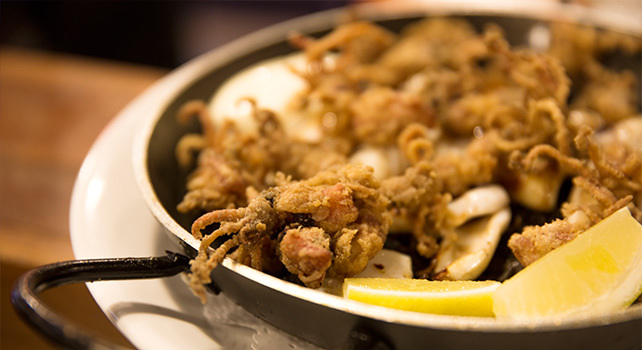 Helmed by Chef Daniel Chavez, the restaurant offers live Spanish-style seafood, at its best. Originally from Peru, Chef Daniel discovered his passion for cooking when he moved to Florida, United States with his family at age 19. After working in some casual style bistros, he decided to travel to Spain and experience working in the best restaurants he possibly could. His first experience in a gastronomic scene was in the one Michelin star restaurant La Sucursal in Valencia, where he worked for one year as chef de partie. Having the desire to work with one of the greatest chefs in the country, he then joined the team of Santi Santamaria in the three Michelin star restaurant Can Fabes for 2 years. Then the opportunity came to fly to Asia and he packed his bags and landed in Singapore, working in Les Amis under the direction of Gunther Hubrechsen. In 2007 chef Santamaria asked him to rejoin his team as chef de cuisine in Ossiano, in the Atlantis hotel the Palm Jumeriah, Dubai. This seafood restaurant quickly became a gastronomic reference in the Middle East, earning a spot in the Top 50 tables in the World 2009 for Conde Naste Traveller Magazine only one year after the opening. In 2010 he returned to Singapore and became the executive chef of a much more ambitious project, “Santi” in Marina Bay Sands hotel where he had the opportunity to create menus “daily” according with the best seasonal produce available in the world. In July 2012 the opportunity came to open his own personal project, OLA Cocina del Mar in Marina Bay Financial Centre. Moving away from the fine dining scene Daniel’s aim is to bring the best traditional cuisine in the most relaxed atmosphere, so you can feel at home! Head on down today to Ola Cocina del Mar’s today and check out their exquisite menu of contemporary cuisines, along with an extensive wine selection.